Antarctica has lost an area of ice the size of Greater London since 2010 as warmer ocean water erodes its floating edge, a study has found. Overall about 1,463 sq km of Antarctica’s underwater ice melted between 2010 and 2016. What does 1,463 fewer square kilometers of ice mean? The findings suggest that melting glaciers on the continent could add significantly to long-term sea level rises, with severe implications for thousands of coastal towns and cities. Your house might wash away. Or not. How close to zero can a number be and still be “a number”? The total area of Antarctic sea ice averages about 11 million square kilometers. So that’s one part in 7,500 that melted or 0.013%. But volume is what matters and the percentage of volume that melted is even smaller. Let’s assume ice volume was lost to a depth of one kilometer (the depth of the “grounding line” where the ice-sheet meets the earth). The giant Antarctic Ice Sheet itself covers 14 million square kilometers and is two kilometers thick, so there are 29 million cubic kilometers of ice there (not counting the sea ice). The volume that melted in this breathtaking news is 0.005% of that. If this six year long trend keeps up, Antarctica will melt in 118,933 years. The Antarctic of course was permanently fixed in all aspects prior to 1979 when the satellite program began. Hence any change at all means blame your car, or coal, or conservative voters. But how much of this melting is man-made and how much is due to hot-magma? In 2015, a seismic survey found there is a blob of superheated rock 60 miles below West Antarctica. Then there are the 91 (count them) new volcanoes we only discovered last year, plus who-knows-how-many we don’t even know about. Perhaps that has something to do with making the water warmer? Follow the reasoning, either a trace gas 10 kilometers up is causing some spots of Antarctica to warm and other parts to cool, or hot magma at 1,200C is. What’s more likely? I doubt we can measure Antarctic volume to three decimal places. But see the error bar point below. Maybe I’m wrong. Who thinks up these area analogies? Let’s compare “Greater London” (or the whole UK) to Antarctica. The TrueSize Map site compares Antarctica to the UK. These scientists at the University of Leeds are not trying to mislead or scare you, they just aren’t good with numbers. Likewise, Ben Webster might not be a one-eyed political activist pretending to be a journalist. Perhaps he just doesn’t have the internet yet. Can someone can send him an email (assuming he has one). How do we measure where the Antarctic Ice Sheet meets the earth underwater? In case you are curious, the grounding lines are 1km underwater and were detected by satellites. Really. The team were able to track the movement of Antarctica’s grounding line using European Space Agency’s CryoSat-2 across 16,000 km of the coastline. Although CryoSat-2 is designed to measure changes in the ice sheet elevation, these can be translated into horizontal motion at the grounding line using knowledge of the glacier and sea floor geometry and the Archimedes principle of buoyancy – which relates the thickness of floating ice to the height of its surface. How big are those error bars? According to the paper: the continent has lost 1,463 km2 ± 791 km2 of grounded-ice area. Cryo-sat has a surface resolution of plus or minus 1.3 centimeters, which is amazingly, fantastically good. Across the full surface of the Antarctic ice sheet, that error works out to plus or minus 175 km3 – plus about the same again for the sea ice extent. So there is 400km3 of error right there. Presumably, the rest of the error is in the guesstimate of how the grounding line relates to the surface. I think we need error bars for the error bars. PS: Fun Tip Of the Day: How big are those nations? The True Size Map site compares Antarctica to the UK. Check it out. It’s a neat site, great for showing just how large countries really are in a comparative way. You can pick any nation and drag and drop. Nations shrink as you move them over the equator and expand as you shift towards the poles. Show the kids. 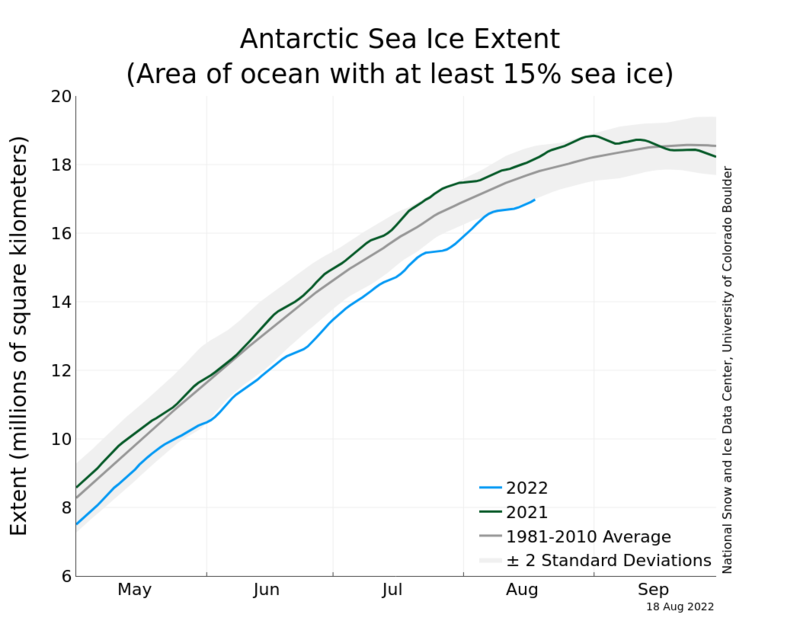 Antarctic Sea Ice Extent – Climate4U graphs NSIDC Data. The NSIDC graphs the current conditions compared to longer averages. WUWT Sea Ice Reference Page.